If you read yesterday's post you'll already be familiar with the Natal Hypnotherapy Premium Package which arrived this week. I've started with the book, written by doula and hypnotherapist, Maggie Howell, Effective Birth Preparation. As I'm still only in the opening chapters of the book, most of the background and theology is very familiar to me, but this is good news - at least it means Maggie (who developed the Natal Hypnotherapy programme that I'm planning to use) and I are on the same page. As part of the introduction to her book, Maggie sets out several pages with space for readers to make their own notes. I've decided not to write in the book as I'd like to be able to pass it on to a friend one day, but completing the personal interview seemed like a good idea, it certainly got me thinking, about myself and my attitudes and approach to pregnancy and birth, which can only be a good thing. Activities like this are so useful, and essential, I believe, during pregnancy. It seems to be that many people don't take enough time to simply be pregnant, to enjoy it, to experience it, or to celebrate it. From Day 1 it seems that there is so much focus on the baby at the end of the journey (and I understand why that's necessary) but less on the journey itself. Everything seems to be about choosing a pushchair, a name, a colour scheme for the nursery, a date to return to work - but there seems to be very little opportunity or encouragement in our modern society to revel in the miracle of pregnancy. This is why I find meditation and deep relaxation so useful, it's really helped me to connect with my pregnant body and with my baby, creating a very secure bond between the two of us. 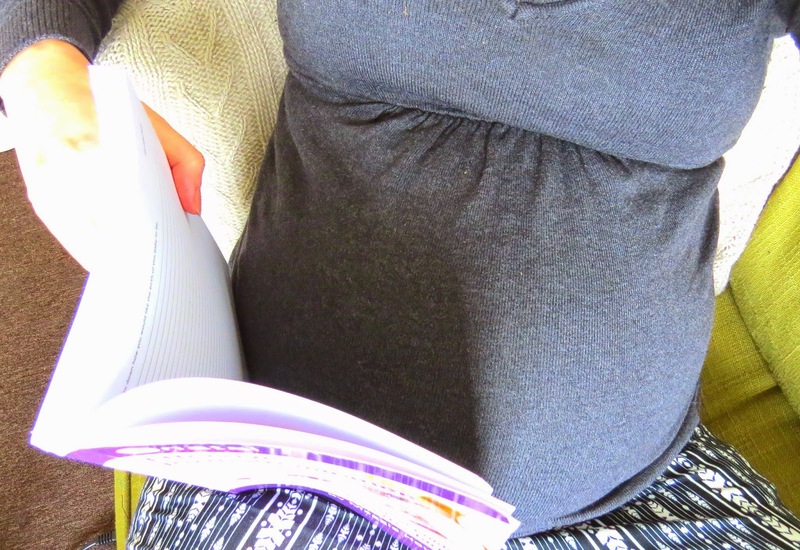 Completion of the questionnaire in Maggie's book allowed me another opportunity to consider my pregnancy and birth in isolation, and I thought today I'd share my answers, as they're nice, just as discussion points in their own right. If you too are expecting a baby, perhaps you'd like to have a go at thinking about your own answers to these questions, how do they differ to mine? Are there similarities? I'd love to hear. Was this a planned pregnancy? NO! It was whatever the opposite of a planned pregnancy is, and by that, I mean even more opposite than unplanned. It's also to be my last pregnancy and as such I guess I will never experience the act of making a conscious decision with another person to try for a baby - and be successful (I'd previously made this decision in another relationship but it wasn't to be). How did you feel about your journey to conception? Well, given the above, it was something of an unconscious journey. Boyfriend and I have a remarkably deep bond, a very passionate and strong relationship and a considerably impressive amount of love for one another - but we'd also agreed, almost immediately, that we would never ever have children. Ever. Under any circumstances. We had already agreed that Boyfriend would, when it was least inconvenient for him to have some time off from work, have a vasectomy, just so that we didn't need to worry about the possibility of failed contraception... our bodies seemed to realise they were up against the clock so promptly got on with making a baby... What were your initial thoughts about being pregnant? I found out that I was pregnant whilst Boyfriend was away working for a week. I told him, in a rather round-about, matter of fact manner, in a text message. It was always understood, and agreed, that if we ever did find ourselves in this situation, then we were both comfortable with, and in favour of, an early termination. Something held me back though. I felt sick, angry (just at The Universe, not at anybody in particular) and completely unprepared, but not quite detached enough. I decided not to make a firm decision until Boyfriend was home. Then until after Christmas, and then, I made a firm decision, and it wasn't the decision I ever thought I'd make. How do you feel now about being pregnant? Well, how things change! You can assume that I wouldn't write about my pregnancy as much as I do were I not excited about the prospect of a new baby, and enjoying the journey along the way. After a very shaky start, I can honestly say that my heart told me the right thing. Something told me that everything would be OK, that this incredibly "unwanted" pregnancy could be a wonderful thing - and isn't it? I absolutely love being pregnant this time around. I have such a connection with Baby, my body is doing well, and I'm approaching child birth with so much positivity - as well as adopting a completely new outlook which couldn't be further removed from the attitude that I held throughout my last pregnancy. I thank myself every single day for listening to my gut (or perhaps, my accurately, my womb) and refusing to be frightened. What are the three main emotions that you feel when you think about being pregnant, and having this baby? it's proven to be the safest place to give birth for all low-risk pregnant women, the benefits offered to Mother, Father, Baby and even the midwives, far exceed the benefits of giving birth in a hospital environment. my first birth was relatively short (5 hours), so it's unlikely that I'll have a long labour this time around, therefore I want to be able to immediately get "into the zone", and not be disturbed - the last thing I want to be doing is finding myself in serious, established labour, whilst trying to settle in to a new and unfamiliar environment. it's kinder to Seb. Preparing for a home birth has meant that arrangements are not as disruptive to Seb - in fact, with absolutely no family locally who'd be able to help with childcare, a home birth is almost the only option that would give me any arrangements for Seb! Who will be with you during the birth? Why have you chosen them to support you? How well do you think they'll be able to support you? First and foremost, I'll be with Boyfriend. It is, after all, his baby! He is also the person I feel most comfortable and safe with in the Universe, so that helps, and I have absolutely every faith in his ability to support me. We're taking time to research specific ways that he can help with childbirth, including labour specific massage techniques in particular. We're also calling upon the services of a doula, or professional "birth assistant", of sorts. The doula isn't a medical professional, but is trained and qualified in helping pregnant women and their families throughout pregnancy, birth, and beyond. For us, this means that Boyfriend and I can very much be together throughout the entire labour and birth of our baby. The doula will help to look after Seb if he is present, reassuring him, explaining what is happening and why/how, ensuring that he has something to eat and drink, and that he's happy throughout the whole process. She'll be our go-between in communicating our wishes with midwives, and making sure that everything in our birth plan is kept in place and is honoured. She'll also be able to offer guidance and help with breastfeeding once Baby arrives. I didn't breastfeed Seb at all so kind of making it up as I go along with that one! There'll be midwives present as well. Our local NHS trust are obliged to provide a midwife to attend any home birth - as is the case across the UK. I have every faith in the doula and midwives as, unlike us, they're trained and experienced in supporting women through labour and birth. The doula in particular is experienced in hypnobirthing and will ensure that the ideals and values of a hypnobirth are maintained throughout - which is handy. If you know, or can find out, what was your own birth like? My Mum never spoke an awful lot about giving birth to me. All the I know is that it was a horrendously painful ordeal that ended in an emergency caesarean, though why the section was deemed necessary I have no idea, in the back of my mind I might vaguely remember something about the umbilical cord becoming wrapped around my neck - it might have been that! If you have given birth before, write down any negative memories and anything that you would like to change for this forthcoming birth. The short journey to the hospital was horrid. My best friend drove me in her car and did absolutely fantastically, but I really wanted to get into that maternity ward, in a room, with the door closed, and on a bed, pronto. Thankfully planning a home birth means I should save myself that inability to get settled immediately. I had a pethadine injection with Seb to manage labour pains, and whilst it worked wonders as a pain relief measure, I missed out on being entirely alert and "with it" for Seb's birth and gave birth to a drowsy, drugged baby. I am keen to avoid that this time around. There are other things I've chosen to do differently this time around, but not especially because of any negative memories. This time I intend to give birth in water (we're hiring a birthing pool for use at home), this time we're having a doula, this time I am using hypnobirthing - hopefully in place of any other pain relief, this time I am having music on whilst I give birth, this time Baby's Dad will be present and supportive, this time I want to delay the clamping of the umbilical cord and enjoy a longer period of skin-to-skin, this time I do not want baby to receive the Vitamin K injection which is usually offered to newborns - and will be opting for Vitamin K to be given as oral drops instead, and this time I'll be delivering the placenta naturally. All very different from last time! Have you ever been to someone else's birth? If so what were your feelings about it? In a word, no. Write down how you would like the birth of this baby to be. I imagine the birth of this baby to be a tranquil, and gentle process. I appreciate that there might be noise-making involved, but I hope these are limited to the natural sounds a woman makes during labour and not the sound of someone in pain. I basically want to give birth like a cat gives birth - cats are my birthing inspiration. I want it to be dark, quiet, and uninterrupted, warm and cosy, peaceful, and most of all, enjoyable. *Effective Birth Preparation by Maggie Howell usually retails for £9.99.